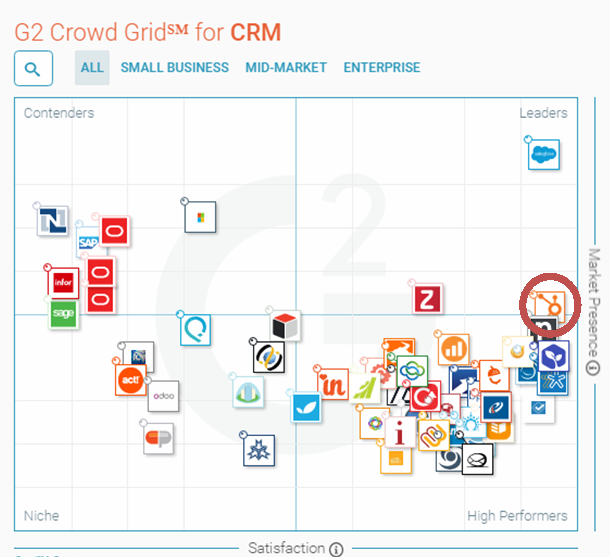 HubSpot CRM adds another feather to its cap as it is named a "Leader" among the world's best customer relationship management (CRM) software by G2 Crowd based on reported user satisfaction, market share, global presence and their global impact. 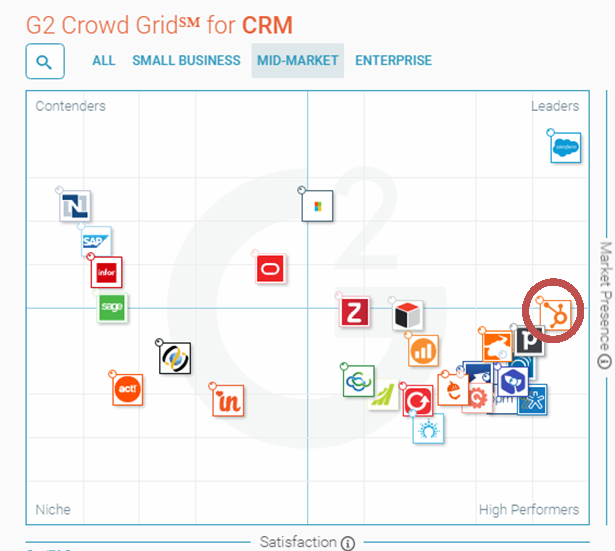 G2 Crowd released its G2 Crowd Grid for CRM which names qualifying CRM platforms as Leaders, High Performers, Contenders and Niche. For the Winter 2016 ratings, HubSpot CRM (part of the HubSpot's newly-released Growth Stack) was named a Leader in CRM systems along with Salesforce CRM, Pipedrive and Zoho CRM. 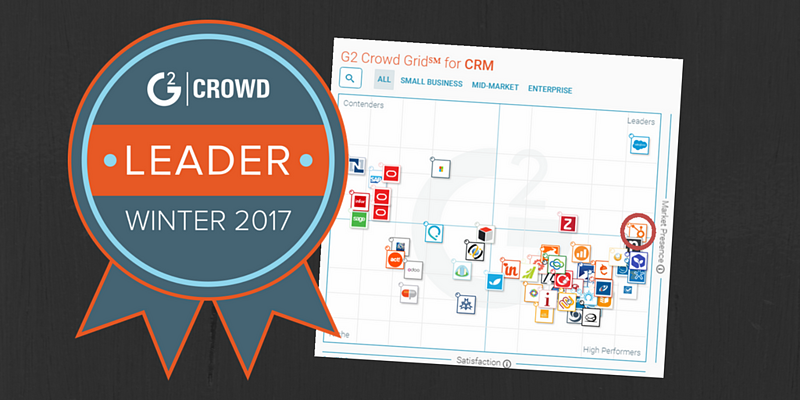 According to G2 Crowd, Leaders are rated highly by G2 Crowd users and have substantial scale, market share, and global support and service resources.The crowdsourced reviews, paired with HubSpot's global presence and market share earned it a G2 Score of 76 and achieved 2nd place among all 158 CRM software, coming very close to CRM giant Salesforce CRM which earned a G2 Score of 95 and is the highest G2 scored CRM platform. High Performers, or those that achieved high ratings from their independently-sourced user reviews but don't have the same market share or scale of the Leaders, included Salesbox, bpm'online, PipelineDeals, Close.io, Insightly, OnePageCRM, Really Simple Systems, Base CRM, Less Annoying CRM, Workbooks.com, amoCRM, InfoFlo Software, Contactually, Salesflare, Bullhorn CRM, Relenta CRM, Nimble, Redtail CRM, iSEEit, ProsperWorks CRM, Maximizer CRM, Pipeliner CRM, Membrain, Prophet CRM, Nutshell, Vtiger CRM, Cosential, Freshsales, and Salesnet. Contenders, which include Microsoft Dynamics 365 for Sales (formerly Dynamics CRM), NetSuite CRM, Oracle Sales Cloud, SugarCRM, SAP CRM, Oracle Siebel, Oracle CRM On Demand, Sage CRM, SalesforceIQ CRM (formerly RelateIQ), and Infor CRM, do have significant market presence and resources but have below average user satisfaction ratings or they have not yet garnered enough ratings to validate them. Lastly, those named as Niche solutions such as Act!, ConnectWise, Odoo CRM, Highrise, Capsule, GoldMine, Apptivo Project Management, and Commence CRM do not have the same market presence nor have received enough user reviews but have been rated positively by the few ratings that they have. G2 Crowd also ranks CRMs based on a small business, medium-sized company or enterprise scale context which allows readers to know which platform is more suitable based on the scale of their enterprise. After all, different companies have different needs and budgetary restrictions. For the Small Business category, HubSpot CRM places very high again as a Leader in this segment along with Salesforce CRM, Zoho CRM and Pipedrive. 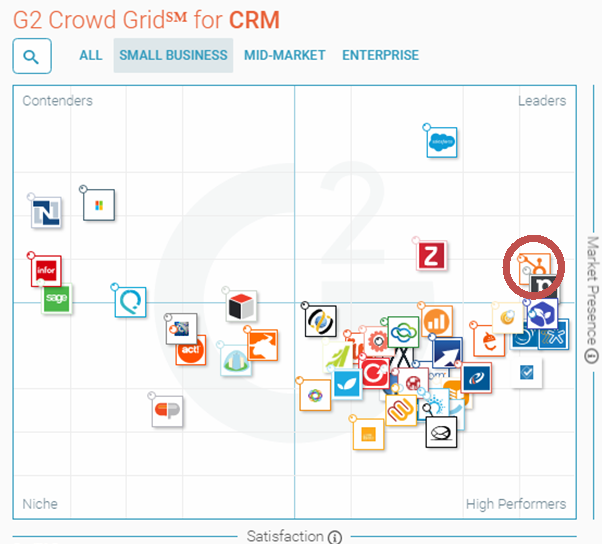 Among all CRM platforms, HubSpot CRM gained the 2nd highest G2 Score rating for Small Business CRM. It was also the 3rd most popular garnering a total of 372 reviews. In the Mid-Market segment for CRM, HubSpot CRM is named a Leader once more and again comes in 2nd place beating Pipedive and coming close to Salesforce CRM which currently leads the pack. In the Enterprise category, the rankings were dominated by Salesforce CRM, Zoho CRM and Pipedrive. Although HubSpot CRM hasn't secured a place in the Enterprise segment, it has been rated 4.5 out of 5 stars by independent verified users. 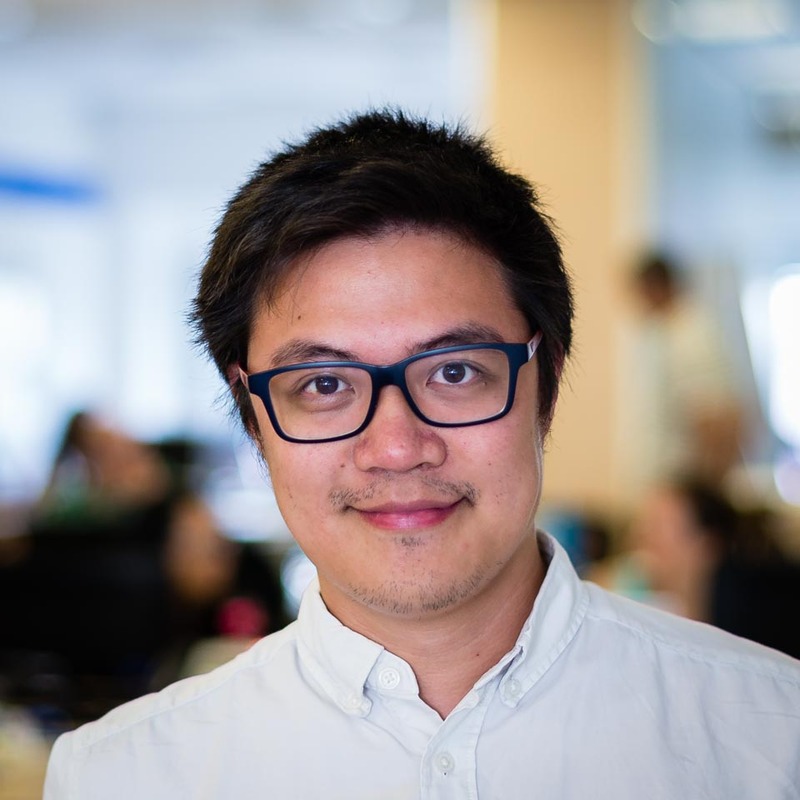 book your free HubSpot demo now!